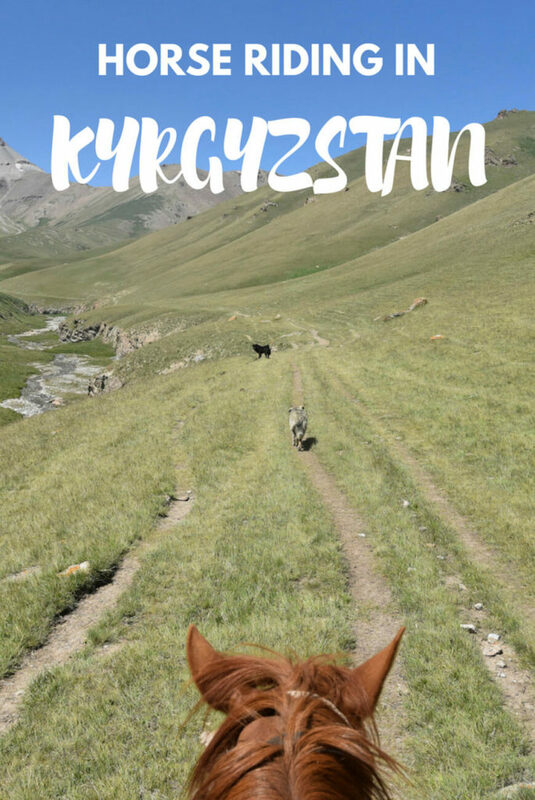 In case you didn’t know, Kyrgyzstan is the land of horses, an element which, for centuries, has been key for the survival and development of the Kyrgyz nomadic culture. Kyrgyz people learn how to ride a horse from the moment they start to walk and use them for transportation, labour and even in their cuisine. 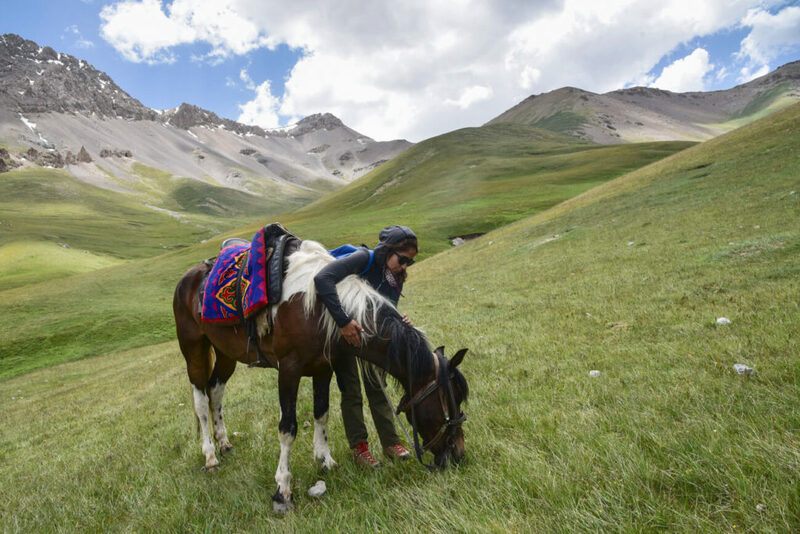 From hundreds of horses grazing over colorful valleys to tens of local people riding them, in both towns and mountains, and even a choice on some restaurant menus; you will never see as many horses as in Kyrgyzstan. 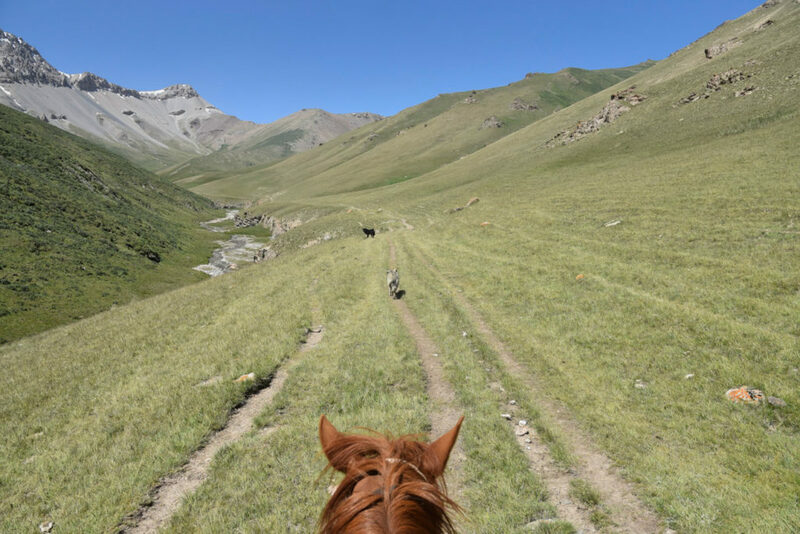 For this reason, you can’t say you have fully experienced this Central Asian country until you do some horse trekking through some of the most beautiful mountains on Earth. 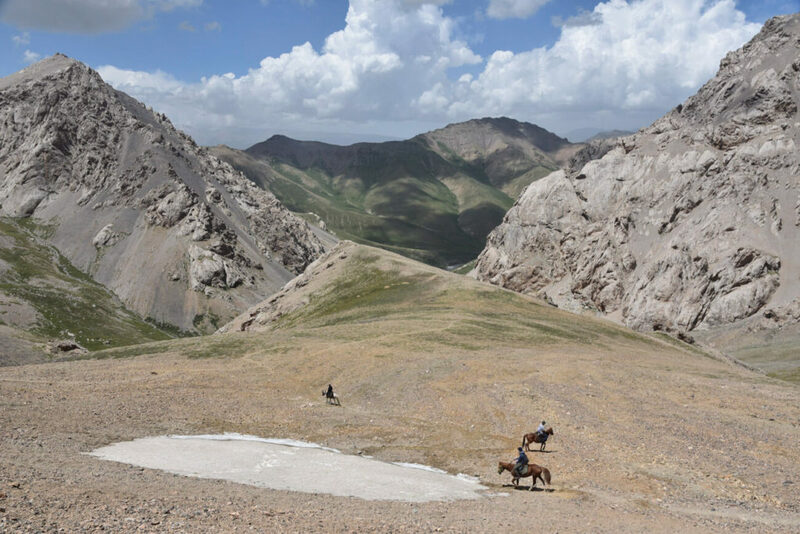 You can go horse riding practically anywhere in Kyrgyzstan. I decided to do it in Tash Rabat, a very important ancient Silk Road route and home to some of the most epic scenery in the country. Due to its remoteness and inaccessibility, very few tourists make it to Tash Rabat. For this reason, when you are wandering around the valley, it’s easy to believe that you might be one of the very few foreigners who has ever walked over those mountains. 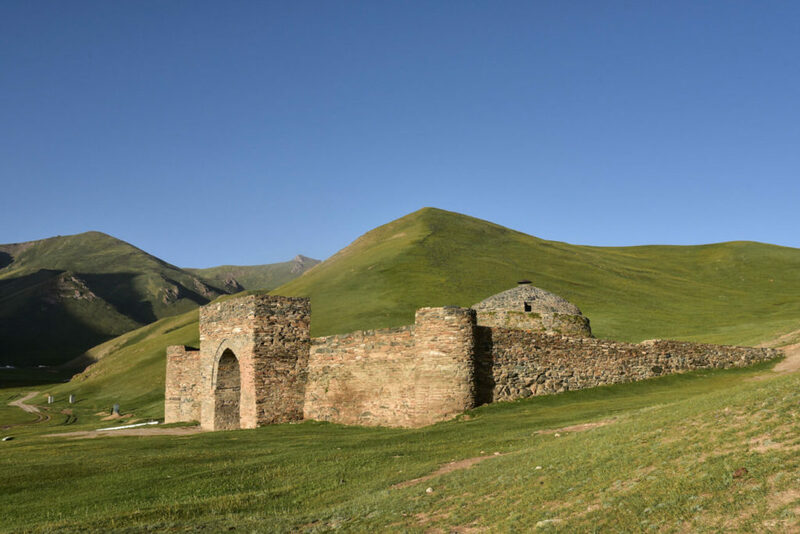 For centuries, Tash Rabat was an important Silk Road route, which endless travelers passed through. From merchants to traders and religious figures, all sorts of different people and generations have walked over these mountain passes, seeking shelter in Tash Rabat caravanserai, a 15th century stone-built building, considered one of the most remarkable monuments in Central Asia, as its big dimensions and structure confirm that this must have been a very important route. 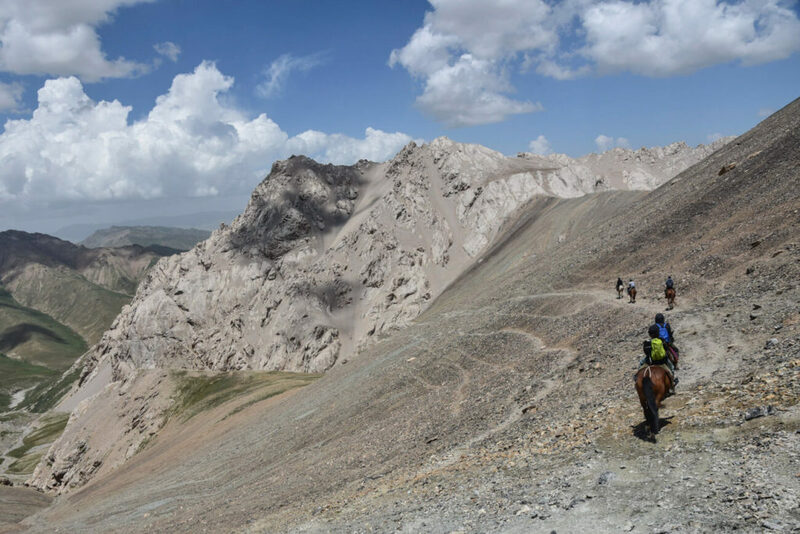 Riding a horse along those mountain trails and thinking that, hundreds of years ago, thousands of Silk Road traders did the same, is such a nice feeling and, for this reason, if you ever go horse riding in Kyrgyzstan, you should definitely do it in Tash Rabat. But this is not all. 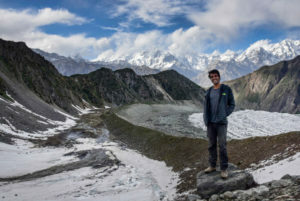 At 3,500 meters, Tash Rabat is placed in a very an epic location, far away from any sort of civilization, surrounded by round peaks covered by a velvet green which, at sunset, gets a goldish tonality. Climbing all those hills on your horse, admiring the striking views and doing some occasional galloping along the valley is, definitely, an experience you don’t want to miss. There are many trekking routes around Tash Rabat but I definitely recommend going to Tash Rabat Pass and, if you have time, to Chatyr Kul. 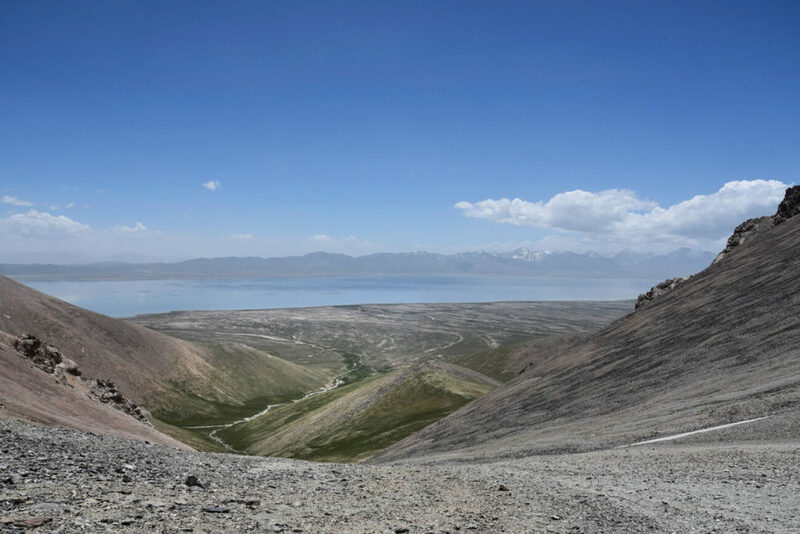 Bordering China (near Torugart pass) and on a massive plain, Chatyr Kul is one of the largest lakes in Kyrgyzstan. 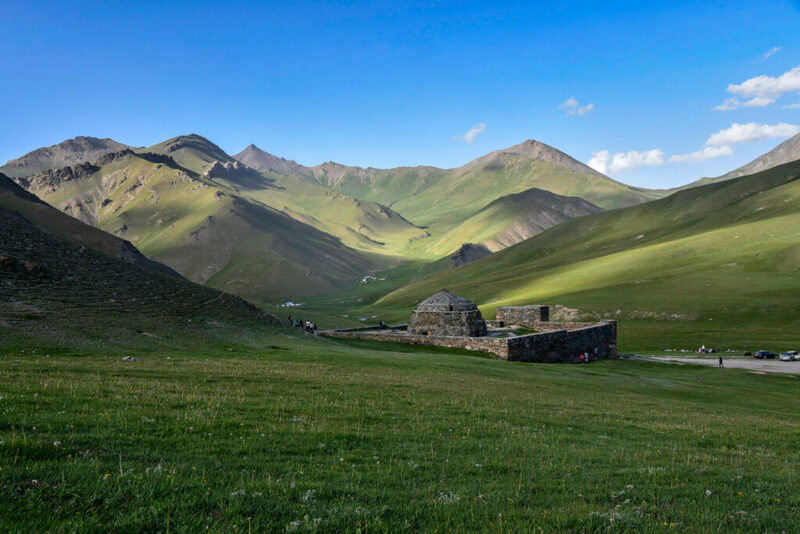 A couple of kilometers before it, you find the Tash Rabat Pass, a 4,000m mountain pass from where you get a 360º view, including views of Chatyr Kul. 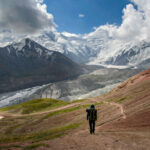 Trekking to Chatyr Kul requires an additional day, as well as an extra permit. The Tash Rabat Pass round-trip trek can be done on a long day trip. You will see. It’s a lot of fun, especially when people start being more confident on the horse, do some occasional galloping and overtake each other. Go slow and take long breaks at every viewpoint. From the horse, everything looks more majestic. Enjoy! Do you require any previous horse riding experience? No, you don’t. A guide will always accompany you and he will give you as much freedom as you want. It’s easier than you think and, when you feel confident, you will see that you can just continue on your own without any help. After telling you how awesome this experience was for me, it may sound funny to you but, did you know that, in Tash Rabat, I had a very bad accident, when I fell off a horse, had to be taken to a hospital in Bishkek and had to stay in bed for two weeks and then took nearly three more weeks to recover? Horse riding in Kyrgyzstan (and anywhere else) is no joke and, if you don’t want to end up like me, you should be cautious and don’t try to gallop if you don’t have a lot of experience, which is what actually happened to me. While galloping, I lost control of my horse, fell off it, hit my back with the ground and got two f***ing hernias. 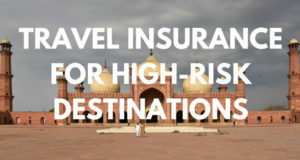 Luckily, I was insured by World Nomads, who took very good care of all my bills. 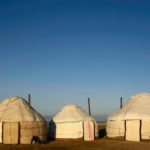 The good thing about World Nomads is that it is the only company that gives unlimited medical coverage plus it covers for trekking up to 6,000 meters, something quite useful when you are in Kyrgyzstan. It’s not comfortable at all and, after a long day, your whole body will hurt. However, people say that you get used to it after a couple of days. Bishkek to Naryn – In order to get to Tash Rabat, you will have first to go to Naryn, the main city in the province. If you come from Bishkek, there are daily marshrutkas leaving from the eastern station of the city. Price should be 300KGS ($4.40) and it is a 5-hour journey. Naryn to Tash Rabat – Tash Rabat is located 120km from Naryn and there’s no public transport going there. The easiest way would be to take a direct taxi, which should cost around 2,000KGS ($30). Since we were six people to split the cost, we chose this option. Don’t ask the CBT office to book a taxi for you, as it will be more expensive. Instead, go to the bus station and negotiate directly with the locals. If can’t find other travelers, a cheaper option would be to go by local shared taxi to At-Bachi (100KGS, $1.50), which is located halfway and take a taxi from there. You can also hitchhike, especially on a truck, as the road goes directly to China via Torugart pass. However, Tash Rabat is 15km from the main road, so you may have to stand there for a while before anyone picks you up. Most likely, if you come from Bishkek, you won’t have time to get to Tash Rabat in only one day, so you may have to spend one night in Naryn. You can also stay in At-Bachi by the way, which not many tourists do. If you don’t have your own camping equipment, you will have to stay in a yurt. There are plenty of yurt camps and, typically, they charge around 800-1,000KGS ($10-15) per person, including dinner and breakfast. I strongly recommend you stay with Elizat, a very nice woman and, perhaps, the only person in Tash Rabat who speaks English. If you want to stay with her and make sure the yurt is available, you can contact her at +996707880161 or send her an email [email protected]. 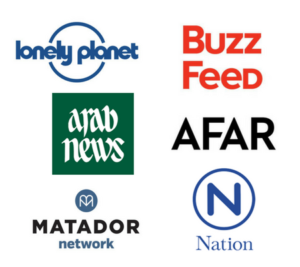 Please note that she has very limited internet access and coverage so if she doesn’t answer you, ask for Elizat once you arrive in Tash Rabat. Her yurt camp is very close to the caravanserai. You can hire a horse from practically any yurt camp in Tash Rabat. I found Elizat offered the best price, which was 750KGS ($11) for a horse and 1,500KGS ($22) for the guide, which can be split among several people. Price is per day. Since Chatyr Kul is very close to the Chinese border, you will need to get a border permit. In order to do so, you should contact the Naryn CBT Office. Send them an email at [email protected] with a copy of your passport and they will do everything for you. Try to contact them 4 or 5 days in advance, otherwise, they will charge you extra for urgent service. Note that, at least, getting the permit takes one full working day (weekends don’t count), so plan accordingly. A non-urgent permit costs 1,000KGS ($15), whereas an urgent one costs 1,700KGS ($25). What if I want to go walking by myself without a horse? Sure, you can. If you want to stay in Chatyr Kul, there are some shepherd shelters somewhere close to the shore. Otherwise, going to the mountain pass takes around 4 hours (one-way). The first two hours, you just need to follow the valley but, at some point, you will have to turn right and start climbing those pretty green mountains. At the bottom of the pass, the landscape turns wild and arid. It’s a pretty tough one. Wow, it can the most amazing experience of ones life, horse riding in this area will be the time which every travelers wants in life. Thanks for sharing your experience with us. 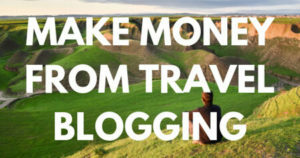 Hi, great information and absolutely amazing pictures! 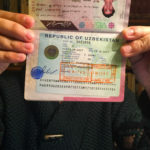 I’ve spent most of this evening reading through your Kyrgyzstan posts and now my girlfriend and I are both incredibly excited for our July trip! A question about the Chatyr Kul element. 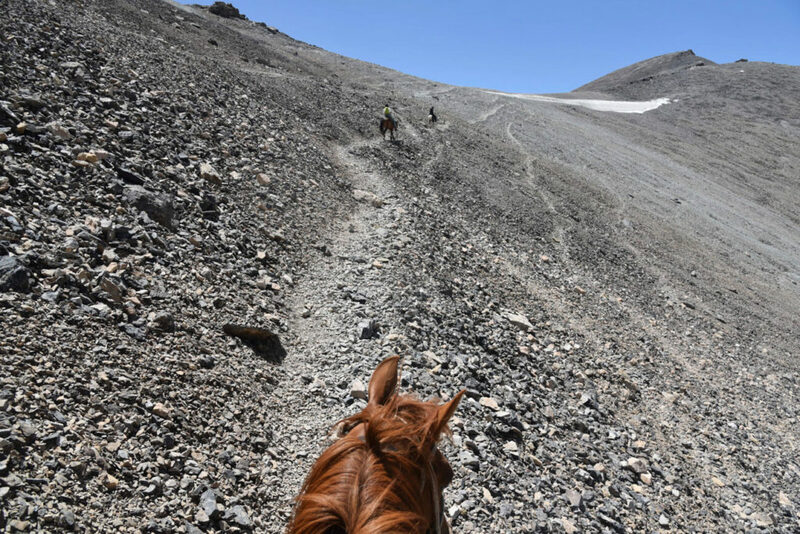 Would you say that that part of the trek is indispensable, or is riding up to the ridge that overlooks the lake “enough”? 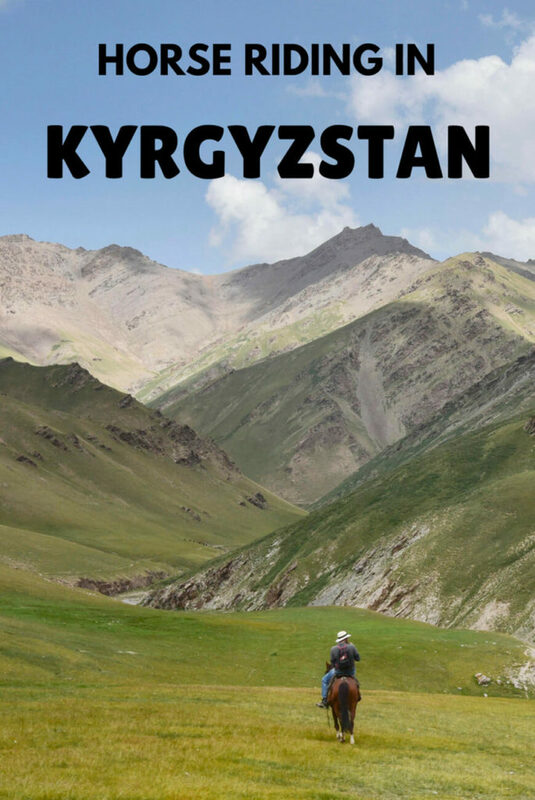 Reason I ask is our trip is set to be 13 days and we want to fit Tash Rabat, Song Kol and Karakol treks/rides in (doing it in this order so that we will be acclimatised by the time we get to Karakol) so hanging around Naryn for a day to get the Chatyr Kul permit may not be feasible. Not to mention the actual extra day that going to Chatyr Kul takes. Would dropping it make sense? Thanks in advance for your reply! Hi Konstantinovs. To be very honest, in my humble opinion, the best part of the trek is the first one, just all the way to the pass. Lakes are always awesome and camping with shepherds next to them is great but you won’t be losing much if you missed it. So yeah, I think that you could skip Chatyr and save 2 days for other more worthy areas. Enjoy! Thanks Joan, that’s good to know! Hey, just wanted to post back and say that in the end we just went to to the pass and back in one day and definitely don’t regret it. I think two days on the horses would’ve killed us, we could barely walk at the end of just one day haha. I think by that point in our trip we wanted to take a break from staying in yurts as well so we were happy with our decision. Thank you for the advice and articles. Our trip was absolutely amazing, a truly special country! Hey! Thanks for your feedback 🙂 Yeah, same here, after one day I was literally fucked :D! Glad you enjoyed! Hi. Nice post. Do you know whether or not it would be possible to hire a horse without a gude and go solo? Or maybe buy one and then sell it back at the end of the trek? Hi, I am not sure to be honest… You will have to ask there but I don’t see why it should be a problem. Regarding buying it, you really know to buy it for a 2-day trek? Hi Joan, we just back from Tash Rabat. We spent two nights in Sabyrbek ‘s yurt camp (the camp located exactly where the two valleys join in one) and it was very nice and cozy. Just for information- we were two adults and two children. The host Cholpon was very nice (her English is very good too). The price was 1200 som for the whole family per night, 400 for dinner and lunch, and 200 for breakfast. Her brother, the driver took us from Naryn and droped us in their village near At Bashy, for total 3800 som. A nice experience in a great place. Maybe a fool question but…do they have helmets to rent?I do horseriding at home and I was wondering if I should bring my own helmet.